StateMachines illustrate how an element (often a Class) can move between States, classifying its behavior according to transition triggers and constraining guards. 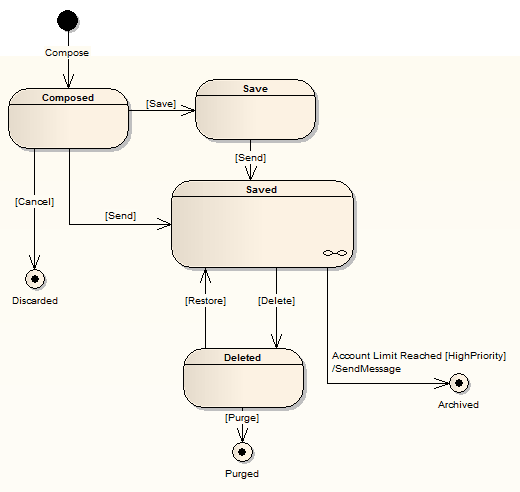 You generate StateMachine elements and connectors from the 'State' pages of the Diagram Toolbox. 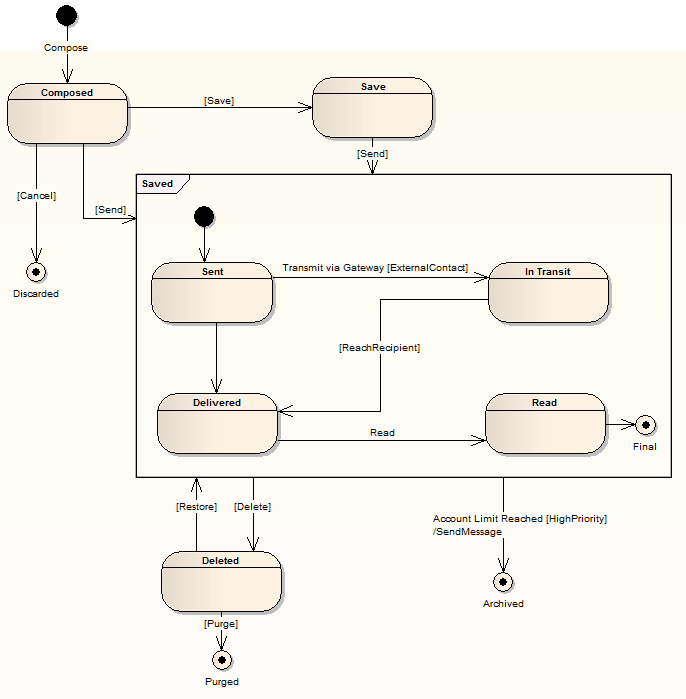 You can display a StateMachine as a diagram, or as a table in one of three relationship formats. Right-click on the diagram background and select the 'Statechart Editor' option. This diagram illustrates some features of StateMachines. The chain-link symbol in the bottom right corner of the Saved State indicates that it is a State with a Composite diagram. By default, the child diagram displays within a labeled frame that represents the parent object in the context of the child diagram. You can right-click on the background and select the 'Hide Diagram Frame' option to hide the frame, and on the 'Show Diagram Frame' option to show the frame again. Alternatively, you can right-click on the composite element on the main diagram and select the 'Advanced | Show Composite Diagram' option, which again displays the child diagram in a labeled frame, but this time within the context of the parent diagram. A State represents a situation where some invariant condition holds; this condition can be static (waiting for an event) or dynamic (performing a set of activities). A StateMachine element is a container for groups of related State elements. There are two types of History pseudo-states defined in UML: shallow and deep history. A Synch state is useful for indicating that concurrent paths of a StateMachine are synchronized. They are used to split and rejoin periods of parallel processing. 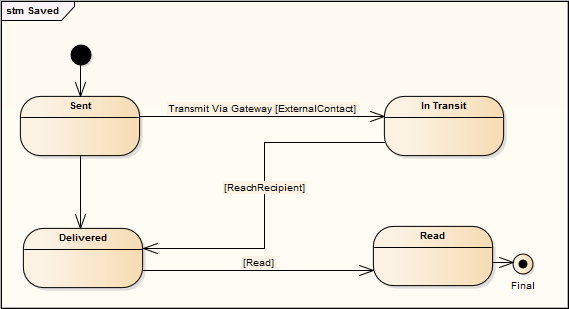 A Transition connector represents the logical movement from one State to another in a StateMachine diagram.